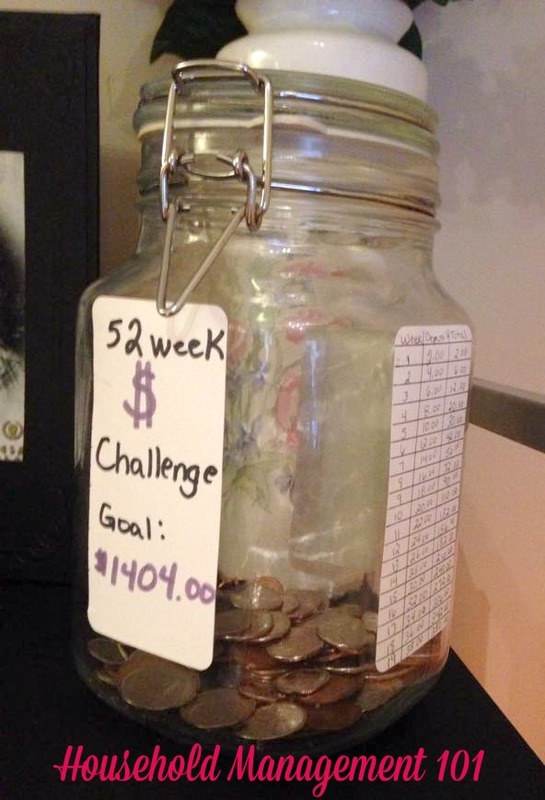 52 Week Money Challenge: Save For A Better Year! You know I'm all about the 52 week challenges so when I saw various version of this 52 Week Money Challenge floating around the interwebs I knew I needed to give it a try. And really, I couldn't have asked for better timing since I'm currently getting very inspired by reading my real life and blogging friend, Cherie Lowe's just released book. Cherie's book is called Slaying the Debt Dragon , and it's about how her family was able to pay off over $127,000 worth of debt. But more than just sharing her personal journey through debt to find hope on the other side, which itself is quite fascinating, more importantly it is a practical guide to help you slay your own debt dragon. 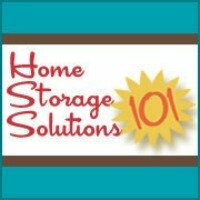 I've been a follower of the Queen of Free (Cherie's blog) for quite a while, and since I also know her personally, I know how passionately she feels about paying down debt and instead saving money. 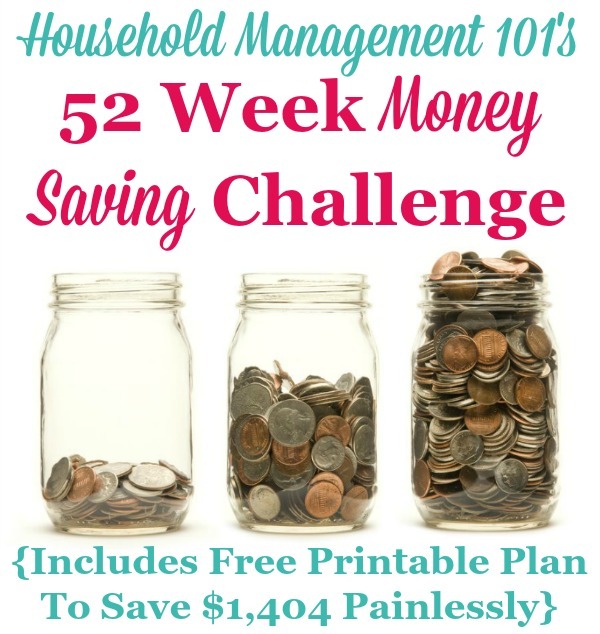 So this 52 Week Money Saving Challenge is dedicated to her! As I said before, I've seen several versions of this challenge floating around on the Internet for years now, so I don't claim this is a novel idea to me. However, if an idea works it doesn't have to be new because it works! Whatever else you should save for, and wait to purchase until you have the money in hand, instead of spending what you don't currently have! How Is This Plan Slightly Different Than Others You've Seen? While I do not claim my challenge is novel I guess I couldn't resist a small tweak to it to make it a little unique. Here's my thoughts about these challenges. If you're not used to saving money putting a large sum aside right away, week after week, can be very difficult. If something's difficult it doesn't get done. Thus starting out slow is key. That's why many of the challenges start out small. Saving just $1 the first week is easy peasy. The problem comes at the end of the challenge, because in December everyone knows that's an expensive month with the holidays. So my challenge builds up slowly, starting with saving $2 the first week, with the largest amounts of money you have to save coming in mid year, and then gradually lessens again. So if you do start in January you don't feel a double pinch at the end of the year when you're both trying to save for the challenge and pay for the holidays. Of course, you can start anytime you want though. I don't want you to be held in by arbitrary dates, so whenever you decide it's time to start, go ahead. Are You Ready To Save $1,404 Painlessly Over The Next 52 Weeks? If you're ready to take the challenge right now, great! Here's the plan. Click the image or the link underneath to get your printable version and to read it more clearly (it's a PDF). Don't Forget To Get Your Copy Of Slaying The Debt Dragon! 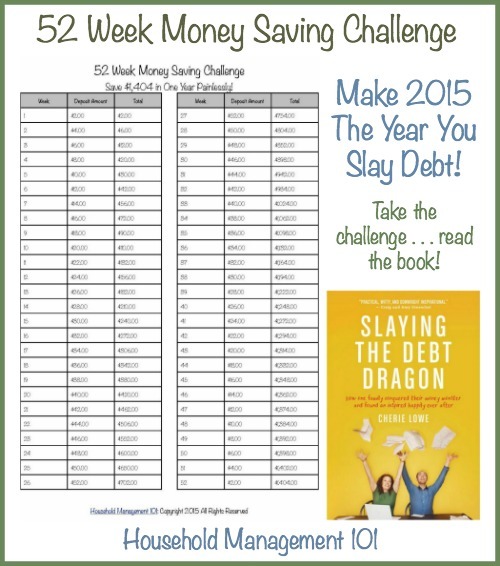 So if you're excited about this challenge, please don't forget to get your copy of Slaying the Debt Dragon . 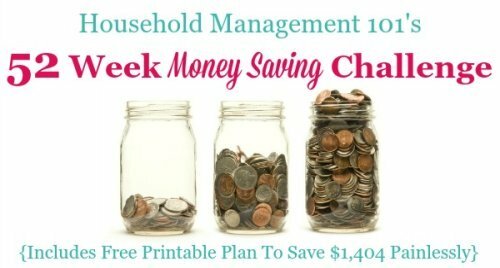 It can give you lots more practical ideas, tips, and inspiration in learning how to save money, spend less, and reach your financial goals!